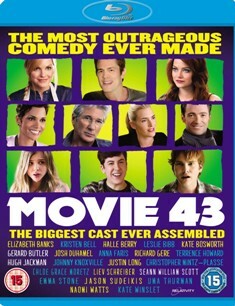 Movie 43 is not really a movie, but a bunch of short films strung together randomly to create a feature-length film. There’s a framing device that is supposed to tie it all together, but in reality Movie 43 is more of an exercise to get a bunch of well-known actors to participate in something they would normally not do. How they were able to get actors like Hugh Jackman, Halle Berry, and Kate Winslet is beyond me, because this film is nothing but sophomoric humor that we are supposed to see as “pushing the boundaries.” I hate to tell them, but the only outrageous thing about this film is that it managed to get made. The Blu-ray offers two versions of the film – the theatrical cut and an alternate cut. Though I hadn’t seen the theatrical version, I went for the alternate cut thinking it was probably an expansion of the original version. Framing the short films was a storyline where a teenage boy and his friend prank his younger brother by telling him about a secret online movie called “Movie 43.” They tell the brother the film is “like The Ring with a better ending.” As the little brother searches the internet for the elusive film, he comes across the vingnettes that make up the rest of the film. It wasn’t terrible, and I didn’t really think much of it, being that it was there for the sole purpose of stringing the short films together. The next day I discussed the film with a co-worker who had seen the film and he tells me he liked the part with Dennis Quaid and Greg Kinnear. “Wait, what? They weren’t in the movie,” I said. He paused, confused, “Are we talking about the same movie?” As it turns out, when they say “alternate cut” they really mean it. The theatrical version of the film contains a completely different framing device where Dennis Quaid plays a struggling screenwriter trying to pitch his script, titled Movie 43, to a film executive played by Greg Kinnear. I don’t know the reasons why there is such a drastic difference between the two versions, but I actually thought the alternate version was a little more fun. The thing about Movie 43 is it’s not the worst movie ever (though I’ve heard it heard it referred to that way), it’s just entirely inconsequential. It’s not as funny as it tries to be, and the short films leave little impact. There are a few that definitely had potential. One that I did enjoy was “Truth or Dare” in which a couple (Stephen Merchant, Halle Berry) are out on a first date and end up engaging in a game of Truth or Dare while waiting for the meal to arrive. The game escalates to total abusurdity, but the actors play it with a straight face and it almost all works. Another decent one was “Super Hero Speed Dating,” where Robin (Justin Long) is desperate to get a date, while the fun-loving Batman (Jason Sudeikis) constantly foils his efforts. I also thought highly of “Homeschooled,” where a couple of well-meaning parents (Liev Schreiber, Naomi Watts) attempt to give their son (Jeremy Allen White) the real high school experience by bullying and embarrassing him as if they were his classmates. This one does push the boundaries just the right amount to be daring and funny. However, most of the short films fall flat. The opening segment, “The Catch,” with Hugh Jackman and Kate Winslet is surprising and well played, but ultimately doesn’t go anywhere. A few of the films try so hard to push the limits of good taste, they forget to tell a coherent short story. I particularly didn’t care for “Veronica” where a formally romantic couple (Kieran Culkin, Emma Stone) can’t seem to keep their hands off each other after to a chance meeting, or “Happy Birthday” where a guy (Johnny Knoxville) gets his brother (Seann William Scott) a leprechaun (Gerard Butler) for his birthday. These short films just didn’t have anything clever to say, weren’t satirical, and they certainly weren’t funny. Overall, Movie 43 is just a collection of barely mediocre short films made by well-known filmmakers, starring well-known actors, who really should have been able to do better. Brett Ratner, James Gunn, and Peter Farrelly are among the directors who worked on various segments. It’s a puzzle as why this film attracted such a notable cast and crew. As I said before, it’s not the worst thing I have ever spent time watching, but I can’t say it’s worthwhile in any way. I guess that I could sum up my reaction to this movie as: “disappointed.” With such a great cast- I had high hopes but was quickly disappointed.